Above: I poured eighteen expressions of Franciacorta on Wednesday in Austin, the “live music capital of the world” and home to one of the coolest wine and food scenes in America today (photo by Buckley Wineholt). 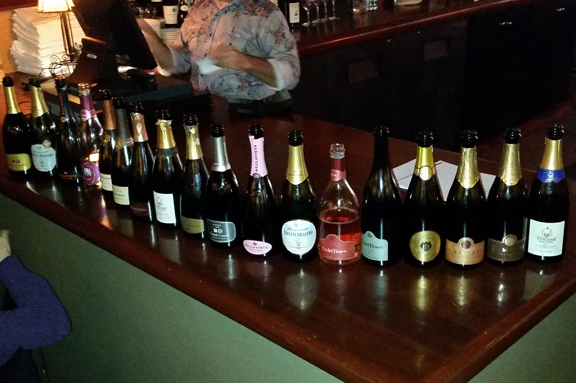 It was a true thrill for me to pour eighteen different labels of Franciacorta for fourteen wine professionals and Italian wine lovers on Wednesday in Austin, Texas (where I lived for five years before moving to Houston). 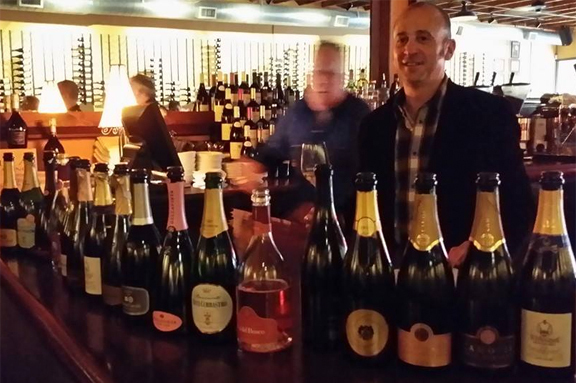 Above: “This mentored tasting was the most extensive sparkling wine experience I’ve ever had,” wrote Buckley Wineholt on his Facebook. He’s the buyer at Urban Wine + Liquor, one of the city’s newest additions to its bustling wine community. 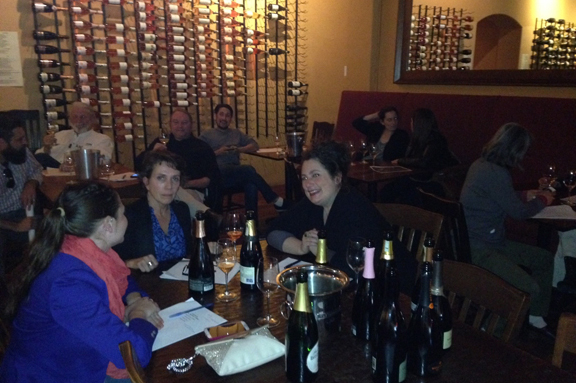 The wines were the “safety” bottles from our Houston tasting that had taken place earlier in the month. And I had capped the number of participants at fourteen so that we would be sure to have enough wine for everyone to taste (actually I had capped it at twelve but being the softy that I am, we added a few more people at the last minute). It was very cool to taste with Buckley Wineholt (buyer at Urban Wine + Liquor), Rachel Del Rocco (wine director at Qui), and Brad Sharp (wine director at one of Austin’s legacy restaurants, Fonda San Miguel), among others. Above: Qui wine director Rachel Del Rocco talked about how Franciacorta’s note of salinity is one of the elements that set it apart in the panorama of sparkling wine. Alyssa Harad, the acclaimed lifestyle writer and fragrance expert, noted the overarching prevalence of ripe fruit on the nose, another one of the appellation’s defining characteristics. It was also super cool to taste with Alyssa Harad, author of Coming to My Senses (Penguin 2013). Although she and her husband regularly drink wine, she’s not a “wine person” as we say in the trade. But I thought it would be interesting to taste with someone like her: She’s a leading expert on perfume and her work is focused on sensation (and honestly, I really wanted to meet her because I’m a fan). 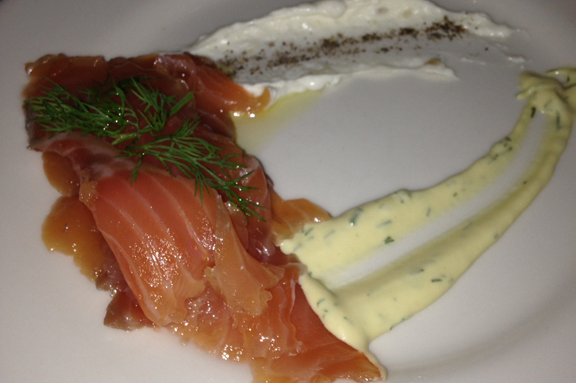 Above: Owner of Vino Vino, Jeff Courington, who hosted the afternoon tasting, treated us to house-cured salmon. It was such a great pairing for the wines. A very special thanks to Vino Vino owners Jeff Courington and Kelly Bell, Jr. for letting me put on the tasting. A big thanks and hugs to the staff who gave us the run of the place and helped us put it together. The Franciacorta consortium is still working on getting samples to the U.S. for future tastings that I will be leading in New York and California (and hopefully also Chicago). In the meantime, I won’t conceal my joy in pouring these wines — that I love so much — in one of the coolest cities in America. Thank you, Austin! You rock, as always.